Todays walk was around the village of Hawkedon just south of Bury St Edmunds in Suffolk. Having driven through the village a few days back and loved the area I decided to spend a bit more time here and see what else was about. The walk took me acorss field to Thurston Hall which is a 15th century manor house and spectacular to look at! 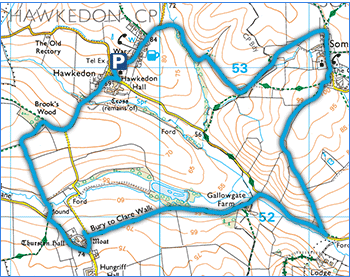 I then followed a section of the Bury to Clare Walk up to Somerton and then across fields back to Hawkedon. The route was all easy going and surprisingly hill for the area. Hawkedon Church in the bright warm sunshine. What's unique about this church is that it sits in the middle of the village green. Old houses around Hawkedon Green. Gentle rolling countryside around Hawkedon. Zooming in on the village from a distance. This is Thurston Hall, built in the 15th Century. More Suffolk countryside looking lush and green. Crossing fields full of sheep. Hawkedon House, sadly there are no public footpaths nearby so this is probably the best view you can get of the house.